The Office of Public Guardian (OPG) is to serve as the public guardian and/or public conservator as last resort for vulnerable adults in Nebraska in accordance with the Public Guardian Act, Neb. Rev. Stat. §§ 30-4101 to 30-4118. Public guardianship and public conservatorship cases shall be managed by the Public Guardian through a caseload distribution of wards and protected persons taking into consideration: the identified needs of the service population; the complexity and status of each case; the geographical area covered by the public guardian assigned; the expertise of the OPG team member; the availability of services to support the guardianship and or conservatorship; organizational responsibilities of the team member and applicable legal requirements. Neb. Rev. Stat. §30-4115(1)(c). The Public Guardian may accept an appointment as public guardian or public conservator for an individual not to exceed an average ratio of twenty public wards or public protected persons to each member of the multidisciplinary team. Neb. Rev. Stat. §30-4115(2). When the average ratio is reached the Public Guardian shall not accept further appointments. Neb. Rev. Stat. §30-4115(3). 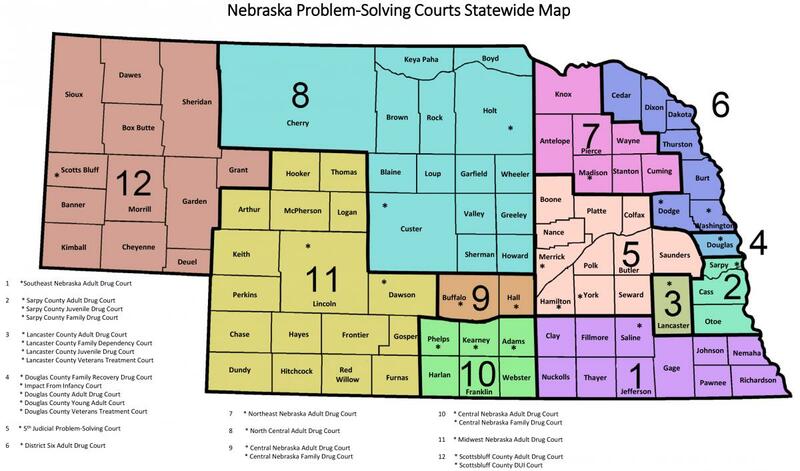 In order to manage case load and case distribution assignments, the OPG has organized in geographic OPG Service Areas comprised of Nebraska counties with OPG personnel who provide guardianship/conservatorship management within the areas. The OPG may reach the maximum average ratio for an Associate Public Guardian in one service area, but not in others. Currently, the maximum case load and distribution capacity limit has been attained by some Associate Public Guardians within the Eastern and Southeastern OPG Service Areas. Accordingly, courts have begun to request cases be placed on an OPG Waiting List for future assignment of a public guardian/conservator when an opening occurs. The OPG Waiting List Process (OPGWLP) Pilot has been developed in accordance with the Public Guardianship Act and Nebraska Court Rules, with input from the OPG Advisory Council, and final direction by the State Court Administrator. The Public Guardianship Act does not specifically address the OPG utilization of a waiting list. However, the Act does direct that the OPG Annual Report include the status of the waiting list for public guardianship and public conservatorship services. Neb. Rev. Stat. §30-4111. In order to track, and accurately report those cases that legitimately meet the criteria for services by the OPG, the proposed OPG WLP reflects the Public Guardianship Act public policy directives that public guardianships and public conservatorships be last resort, least restrictive, provide only necessary services, and support individuals in the least restrictive manner possible. Additionally, the OPG WLP complies with Nebraska Court Rules that a court may request a case be placed on the OPG Waiting List, as provided by the OPG. Neb. Ct. R. §6-1433.01(D) and (J). Within ten days of the request the court will assign a court visitor or guardian ad litem to provide a report, on a form developed by the Supreme Court Administrator’s Office, to assist the OPG fulfill its duties mandated by the Public Guardianship Act. Neb. Ct. R. §6-1433.01(E) and Neb. Ct. R. §6-1433.02(F)(2). The OPG WLP Pilot provides for a 90 day limit for placement on the Waiting List; allowing for subsequent requests for the case to be placed on the Waiting List again, subject to updated status information regarding the case. These requirements were included in the OPG WLP as a result of lengthy discussions with the members of the OPG Advisory Council. The Advisory Council was concerned that without a specific time limit, and a process for updated information outside of OPG’s responsibility, the Waiting List would require ever expanding utilization of OPG time and resources to manage the hundreds of cases on the list; as well as heightened scrutiny, demands, and expectations of the OPG regarding the allocation of openings. The 90 day limit mirrors the time frame in temporary/emergency cases; and the requirement for updated reports, prior to repeat placement on the Waiting List, puts the burden for information justifying a request for a public guardianship or public conservatorship on the plaintiff who is requesting the appointment, rather than the OPG. The criteria, under the OPG WLP for choosing a case from the waiting list or from an active emergency/temporary case when an opening for public guardianship/conservatorship occurs, seeks to align with case load and case distribution mandates, and the public interests undergirding the duties of the Public Guardianship Act. Those duties include the OPG to provide: immediate response in an emergency situation; an option, without a lapse in service, to a ward or protected person; equal access and protection for all individual in need of guardianship or conservatorship; and safeguard the rights of individuals by exploring all options available to support individuals in the least restrictive manner possible, and seek full guardianship only as a last resort. Neb. Rev. Stat. § 30-4115 and Neb. Rev. Stat. 30-4105. The limited resources of the OPG do not allow for full compliance with the duties listed for all cases and the OPG cannot meet all requests for public guardians and public conservators. However, the OPG Waiting List Process Pilot seeks to fulfill the public interests of OPG duties to: meet emergency needs, continue service for wards, provide equal access, give protection, safeguard individual rights, give least restrictive options and utilize public guardianship as a last resort. The Supreme Court has determined to initiate the OPG Waiting List Process as a Pilot Process through June 2018. At that time the process will be reviewed to determine if any adjustments should occur.